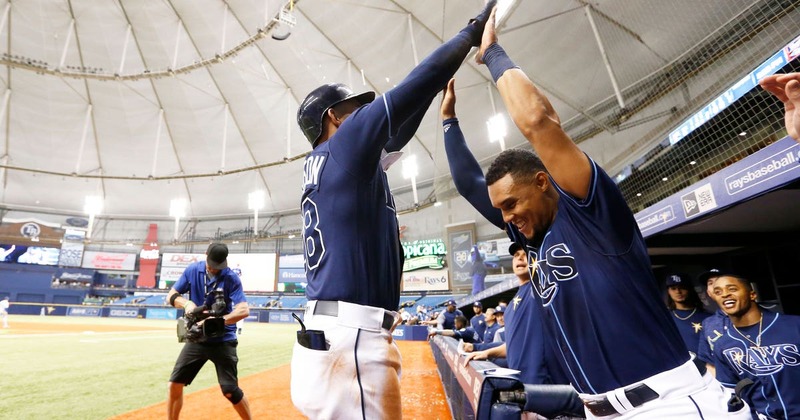 ST. PETERSBURG, Fla. (AP) —Mallex Smith had four hits and Blake Snell struck out nine Monday night to help the Tampa Bay Rays stop a four-game losing streak with an 8-4 win over the Texas Rangers. Smith bunted for a single against starter Martin Perez (1-2) in a four-run second inning that gave the Rays a 5-0 lead. He doubled and scored in the third on his way to a second four-hit game in eight days. Snell (2-1) gave up one run and five hits in 6 1/3 innings, the third time this season a Tampa Bay starter has pitched at least six innings. C.J. Cron hit his second homer and Daniel Robertson connected for his first off Perez, who gave up seven runs and 10 hits in four innings. Profar was in concussion protocol after being upended by Smith’s slide in the second inning. Profar came down on the side of his head after making a throw toward first base. Duffy left in the first inning with right hamstring tightness. INF-OF Renato Nunez, claimed by Texas on waivers Sunday from Oakland, was added to the 25-man roster and OF Ryan Rua was optioned to Triple-A Round Rock. … The Rangers acquired C Tony Sanchez from Cincinnati for a player to be named or cash and assigned him to Round Rock. Rangers: OF Delino DeSheilds (broken left hamate bone) is hitting off a tee. Rangers LHP Matt Moore, who pitched his first 5 1/2 seasons for Tampa Bay, will make his first start at Tropicana Field as a visiting pitcher. The Rays’ starter is to be determined.